On the eve of the 100th contesting of the Tour de France I think it’s important to put in perspective what the riders who finish in Paris three weeks and one day from tomorrow will accomplish. They are after all competing in the hardest race in the hardest sport in the world. Now I’m sure there are some doubters out there. Here’s how I came to my conclusion. There are four areas into which I have broken sport down: Difficulty of Contest, Risk of Injury, Deprivation, and Conditions When Performing. (These probably are not the best names but I’ll explain each one below.) Given that sports fans have a strong bent for numbers I’ll list the sports that I think are up near the top in each category on a scale of 10. This is an absolute scale where at least one sport has to be a 10. I’ve also assumed that when we are talking about each sport that we are talking about the highest, most difficult level of that sport. So when I’m talking about boxing I’m talking about a championship heavyweight bout. When I’m talking about mountaineering I’m talking about serious alpine pursuits in the Himalayas or similar locals. And of course when I’m talking about cycling I’m talking about the grand tours. This one should be pretty easy to get—the TdF is contested in 20 stages over a three week span. Almost every stage is probably the sporting equivalent of running a competitive marathon. Now get up the next morning and do it again. And again, And again. In this year’s tour the riders will ride nine stages before the first rest day. The sheer physical toll of competing at the speeds, and the distances that these riders do is massive. And if your team manages to get a rider into a position to win a jersey or a stage, the stakes get higher and your effort is multiplied. Multi-year sponsorships and long-term contracts hinge on three weeks in July. The only thing that can come close to matching the length and difficulty of contest is mountaineering. But points have to be taken off there because there are some decent chunks of time just sitting around, acclimatizing, waiting for weather and such. Those tempted to say long tournaments like the Soccer World Cup should be reminded that the actual contests are only 90 minutes in length with plenty of off days in between. It doesn’t even come close. The typical tour rider already has an injury that’s nagging him before he even rolls out of the start house. He’s had to compete in a certain number of races earlier in the calendar year just to prepare himself to be physically capable of finishing the TdF. Those races have been held in wet, cold conditions on the cobbled roads of northern Europe and the jagged slopes of the Dolomites or the Swiss Alps. Chances are he’s already been sick, has touched pavement* several times and has some sort of overuse injury because he tried to ride himself into shape early in the season and did too much too quickly. Tendonitis is a common word in the peleton. A rider’s only protection is a thin layer of lycra and a plastic and foam helmet. It is not uncommon for a rider to finish a stage with a broken bone, (typically rib, shoulder, wrist, hand, hip, or collarbone) or bleeding from cuts and road rash, or concussed. During the Tour he’ll be one of the lucky ones if he doesn’t go down at least once or come down with some sort of cold—which is sure to become a full-blown respiratory infection as he strains to drag himself over the high mountain peaks of the second and third week of the tour. When it comes to death the statistics speak loudly. This is certainly not something to celebrate but it’s the reality for the professional rider. No one has died in an NHL game. Only one person has died in an NFL game. Woulter Weylant, Andrey Kivilev, and Fabio Casartelli have all died in the last 20 years. Juan Mauricio Soler will never be the same after his horrific crash in the Tour de Swiss. There are many others who have survived crashes but will never race again. In the death category mountaineering not surprisingly surpasses cycling. On K2 alone two people die for every seven that attempt to summit. And when it comes to debilitating injury, the NFL is worse than cycling. Rare is the retired football player who is not physically wrecked in some way. Their life spans are even cut short. 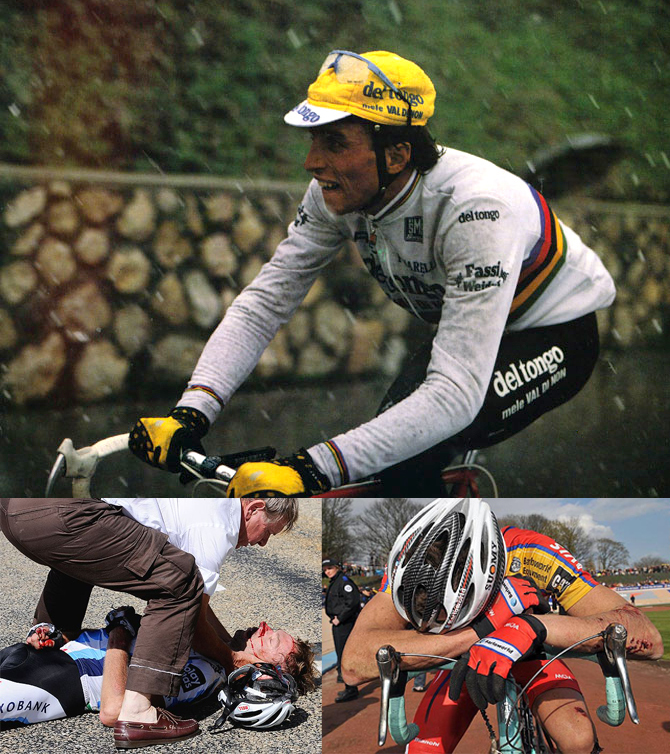 Still though, when all categories of injury and death are concerned, cycling is near the top of the list. If you want to be fat then just call yourself a cyclist. Those last 10 pounds you thought you needed to lose? Make it 25. Or 30. Until we can see the ribs in your back when you are wearing a skin tight shirt you’re not there yet. This is the real ace in the hole for cycling when it comes to putting it over the top as far as difficulty is concerned. Maybe the horse racing jockey is close. Certainly the mountaineer who spends weeks on the side of mountains in an attempt to scale them is close as well… but for a much, much, shorter stretch of time. That has to be accounted for. Cyclists have been known to talk about foods like they are some sort of mystical creatures never to be seen. Ice cream, cake, cookies, beer, pizza, wine—these things will not help you scale mountains. Most professionals allow themselves about 6 weeks to be normal people, but somewhere in late December after Christmas, they get back on the wagon. Paris Nice after all, is only about 8 weeks away. If the straight up deprivation isn’t bad enough, then think about having to flip the switch in your digestive system when the Tour starts. Now, instead of denying yourself you have to fuel your massive physical effort by cramming 8,000-9,000 calories down your gullet each day. Your system can’t take the shock? Too bad. You’ll be riding at the back of the pack if you are lucky. More likely you’ll be on the train home. There have been riders who have had to retire from the sport just because their digestive systems could not handle the demands of professional racing. Imagine. Rain, light snow, cold, sleet, high altitude, wind, blistering heat, bubbling tarmac, cobblestones, narrow roads, dangerous descents, obstacles in the road (some fixed, others moving), nervous fellow riders—the professional cyclist is required to ride with, through, around, and over all of these things. The faint of heart need not apply. Football season doesn’t even start to get nasty until November. Play stops in baseball if it’s too wet, or too cold. Basketball, Boxing and Hockey are played entirely indoors. Horse races are incredibly short. Maybe the mountaineer is again the only real competitor here. So, there it is. If there’s any sport that I’ve missed that requires such massive preparation, is contested in such difficult circumstances, and carries as much risk—and is just that incredibly difficult to even finish the contest, then I’m ignorant to it. Cycling, without much question, takes the cake. * Just the fact that cycling has a euphemism for crashing goes a long way to proving that this is a very demanding sport. To say that a rider has “touched pavement” when in fact they have crashed at 30+ miles per hour is a akin to saying that you have suffered a scratch when in fact you’ve cut your finger off.